You must make reservations at least 5 minutes in advance of the time at Trunk. On-street and secure parking are available adjacent and nearby. Located one block east of La Trobe Street Stop #8 and nestled between Parliament and Melbourne Central train stations. Trunk opened its doors in December 2007 and has quickly established itself as an exciting contender in Melbourne's thriving food and wine scene. 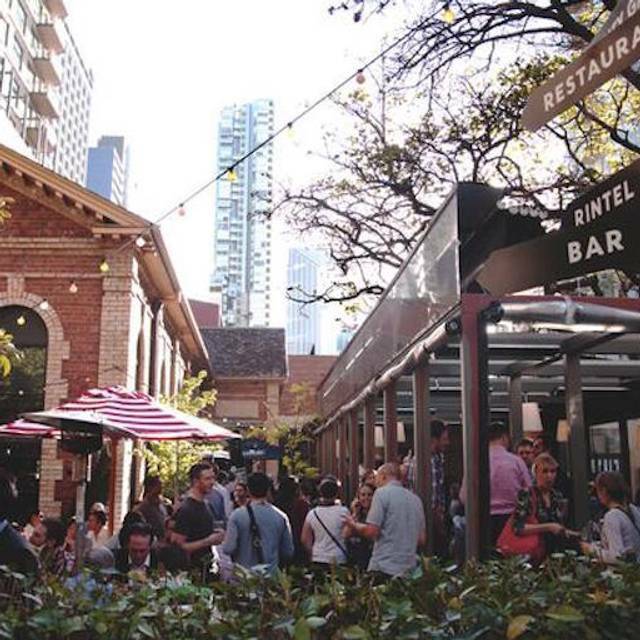 Occupying the garden corner of Exhibition and Little Lonsdale Streets, it boasts one of largest outdoor courtyards in the CBD, and is home to a 150 year-old heritage listed Coral Tree, which inspired the name 'Trunk'. Showcasing modern Italian food and pizza, as well as a large selection of local and international wines, beer and cocktails. Trunk is one of the most unique and versatile venues in the CBD. In July 2010 Trunk opened its Diner (next door) A breakfast and lunch joint serving: Waffles, Eggs, Cheeseburgers, Quesadillas and lots of other Diner classics. Reception service was great. We asked our wait staff for wifi password. She did not know and said she would find out. We are still waiting. We ordered a bottle of wine, initially we were brought a part bottle. Actually $60 was expensive. I was so disappointed in my experience at Trunk. It was a special night so I booked online a few days in advance. We were not greeted at the door by a hostess so stood around not knowing where to go. We stood around and a few staff members saw us and gestured to move along the bar to the back. Along the way we were passed along by 3 different staff members before we were seated. The booking I made was not there so we had to wait for a table to be set. The meal was taken away before we were finished, we were not asked if we had finished eating and some of the plates were still only half eaten. After the table was cleared we saw two mice running around under a nearby table which made me feel really ill. If there were mice in the dining area, what condition was the kitchen in? We advised the staff about the mice and they blamed building works close by. I assume these matters should be addressed with pest control measures so mice are not running around the restaurant regardless of the cause. I was so disappointed in the whole experience as I had been before a couple of years ago and enjoyed the experience last time. I sent an email outlining my concerns but as four days on I have not recieved a response. Great atmosphere. Great food! Lovely staff - they were willing to reduce the volume of the music to accommodate a member of our party who had hearing issues. Highly recommend! Service was great, equal balance of attentive and time to talk without interruptions. The food was fantastic! Great choices as well, including the wine list. The only downside was the noise, however the building is historic so I get that soundproofing may be a problem. Great time at Trunk. Good food and wine. Quiet vibes but I didn't mind. Trunk has proven to be an ideal venue for pre theatre dining for us. The food is always appealing and extremely tasty. The staff are friendly and attentive. Will keep coming back. great place to visit although it can get very noisy on a busy night. I would have recommended this place from past experiences, unfortunately not after our recent experience. The lamb was dry, the venue music level was bearable even for able hearing adults. There is a difference between ambience and night club. I am sure the music helps the staff enjoy their shift but what about the paying customers trying to have a good catch up. I had a couple of cancellations in my party and there was no hesitation to move us to a smaller table, the service was very professionally and they were very happy to adjust to my needs. Beautiful food and service. It was extremely hot weather so there werent many customers (the city was very quiet in general). We had an enjoyable pre-theatre meal at Trunk. The waitress was very friendly and efficient. She did ask if we were going out and made sure the kitchen was aware we had a deadline. The food was beautiful. My lamb was fell off the bone, my husband chicken was perfectly cooked. Our friends’ pizza and risotto was quite enjoyable. Nothing was left. Would definitely head there again. We had a fantastic time, the staff were help, the food was lovely and the overall experience was perfect. We were just meetin friends before going to a show. We were short on time but our pizzas came out in no time at all. They were all delicious and the chef even treated us to some fries as we were waiting for a few minutes extra! Too nice! The service and the ambience was lovely. Finally!! a normal restaurant with good service. Normal portions, good flavour. You pay what you get. Will come back for sure. Food was sooo good, cannot fault it. Especially the labne and lamb dip...couldn't get enough. Service was great too. A little loud but I guess it's a bar too so you deal with it. The food was good and the service was fine, but it was a 39 Degree day and we were put inside where they seemed to have no air-conditioning and no notification or discussion about there being no aircon. the only comment that was made was an apology at the end of the meal by the very nice girl who was our waiter. It would have actually been better to have sat outside where there was some wind. they could have just said 'sorry we are having trouble with the aircon" or something to let us know why it was an oven inside. The wait staff were extremely friendly and helpful . The food/cocktails were delicious and didn’t take long to come out from the kitchen. Delightful. Good range of options for all good types. Pleasant staff attentive but not instrusive. The Persian pavlova was beautiful and delicious you must try it. We dined in the restaurant (as opposed to the nearby burger area) and the food and service was excellent. It can be a little noisy but there were two large groups nearby which didn't help. You can also sit at the bar and enjoy a cocktail or a beer or wine. A really nice venue. Reasonably priced and good value for the quality of the experience. Great restaurant with beautiful food, the service was great but the staff hovered over us a little to much, needed more time between courses. Overall a great place for dinner. We will definitely come back. I was quite disappointed with my recent dining experience at Trunk earlier this week. The lady shared the lunch specials verbally with no prices. I orders the fish and salad special and it was delicious. When we got the bill I was quite surprised when it was $36 (that is not a special) and should have been quoted to me at the time of ordering. There was salmon etc for high 20’s price so I figured it would be around the same if not on the cheaper side. Will think twice about going back there for lunch. Went there twice for business dinner. Both times we had to wait for a long time before food arrive. Nice dessert and sides. Main was a little let down. We came for dinner and the food and service to our table was very good. Unfortunately a waiter for a different table continually knocked into the back of one of our chairs (8 times!) after the first few times we requested he please take more care as there was over a metre between us and the nearest table so no need for it to happen, he brushed it off and continued to knock into the chair. Needless to say this was a big negative for our dining experience. Prompt and effective service - with a warm and very genuine smile. a bit noisy, Difficult to have a quiet conversation. The food was delicious, the service outstanding, however the noise was intolerable. We couldn't speak and be heard to the people next to us and had to shout. This reduced how I could rate the place and I would choose somewhere else next time because of this alone. Recommend some sound/acoustic work. Thoroughly enjoyed dining here for lunch with a group of work colleagues. All round lovely experience including service, food, atmosphere and delightful interiors. The service was great and the food was even better!